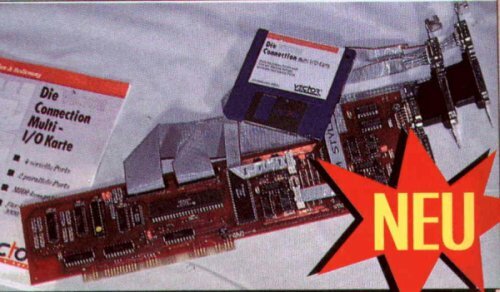 A multi-I/O, Zorro-II board for Amiga 2000/3000/4000. It features up to 2 parallel and up to 4 serial ports at speeds up to 115200 baud. 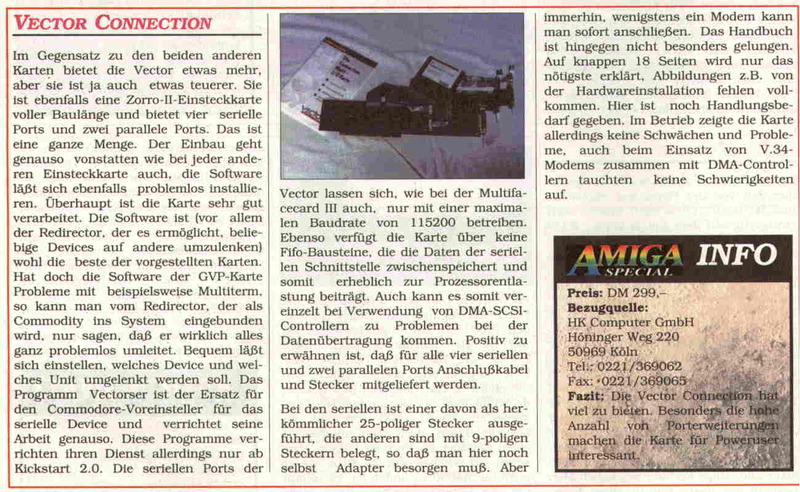 The older software will run under AmigaDOS 1.3. However, the latest software version requires at least AmigaDOS 2.0. The back cover of the board has two serial ports. Two additional slot covers, each with a serial and a parallel port can be installed if more ports are required. Their cables will then have to be plugged onto the board. The old software requires some changes in your user-startup file. ago). The software is stable. need to know and use CLI utilities. The software fits perfectly in the OS. tested (2.2) did not produce any problems any more. adapters are supplied with the card. 4-byte FIFO buffer. As a result, the baud rates have some restrictions. 76800 at the same time, but not at 115200 and 57600.
and it worked, but I did not use it regularly. understandable for beginners and experts alike. know if an English version is available. like the new software, too. board for two years, I sold it and bought myself a GVP I/O Extender. you want to use V.34 modems, you have no choice anyway. never got an answer. Fortunately, I was able to solve the problem on my own. the law. HK-Computer does not extend this warranty. price. I would recommend it if I was asked by a friend. I rate this product 4 stars out of 5. This review is freely distributable, but not for profit. chip select is negated on a write cycle? The answer is derived from a combination of two specifications. defines the data hold time relative to W going high (Tdh). data hold time relative to the CS. of series resistance of 200 ohms suffice? What value of shunt resistors must be used with the MC2681/MC68681? Which MC68681 signals require a pull-up resistor? resistors if they are used as open-drain, active-low outputs. What happens when I read a reserved register on the MC68681/MC2681? with DS* from the processor. Describe the receiver FIFO of the MC68681/MC2681. circular queue. It has both a head pointer and a tail pointer. of the FIFO are not flushed when a reset receiver command is issued. pointer in a circle until it gets back to its original location. reading the receiver. If the bit is set, the receiver should be read. the RxRDY bit. If it is set again, the receiver should be read again. be incremented beyond the current valid data. How can I detect the end of break"? bit times, it loads a zero character into the receive FIFO. and discard the zero character in the receive FIFO. without first disabling the receiver and transmitter? values to the mode registers can produce the same results. may appear during the change from one frequency to the next. These pulses may cause the receiver and transmitter to lock up. places the DUART in a known state. the transmitter is not currently sending a character. that MR1 = 1. Then, enable the receiver and transmitter. 5. Wait until the TxEMT bit is set (character sent). MR1 = 0. Then, enable the receiver and transmitter. receive FIFO if the address matches. What are my options for driving the X1/CLK and X3 pins? cycle, add a 100 Kohm or greater resistor across X1/CLK and X2. probably many more vendors; these are just the ones we know of. Multiple DUARTs can be driven from the same crystal. inputs (remember to ground X2 on these devices). must be taken in choosing the transmitter at the other end. present for at least 50 microseconds to guarantee recognition. When do the output ports go high after RESET is asserted?